Looking for a new, delicious way to prepare salmon? Try poaching in olive oil! Contrary to what many may assume about this style of cooking, the fish does not actually absorb the oil, making it an extremely healthy (and tasty!) dinner idea. When you poach salmon in olive oil, the oil surrounds the protein in fat so that it literally steams from the inside out. The key is to keep your oil at a very low temperature—too hot and you will burn the delicate fish. The whole process only takes about fifteen minutes and the olive oil can then be strained and repurposed so that it doesn’t go to waste (I would use the oil to poach more fish). 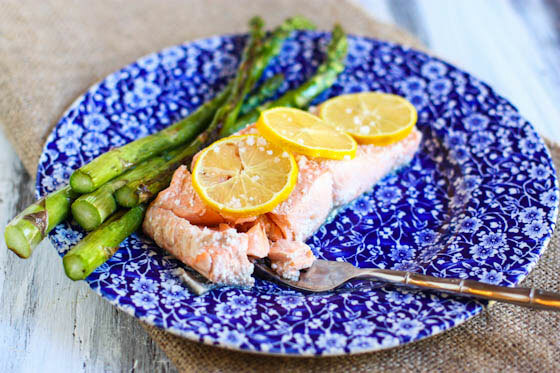 The richness of the olive oil gives this salmon a unique flavor when poached in the liquid. 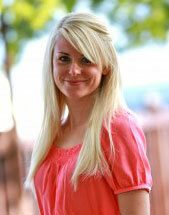 Food blogger Jenna Weber of Eat, Live, Run shares this recipe in full post at the Fresh Tastes Blog. Pour the olive oil into a deep pot. The pot should be large enough to fit both fillets of salmon, but small enough so that the fillets fit snugly. If your pot is too small, try poaching one fillet at a time. Turn the heat on the lowest setting possible and wait until the oil reaches about 100 degrees (comfortably warm when your finger is dipped into it). Gently add the salmon fillets so that they are completely submerged in the oil. Keep heat at low and poach slowly for about 15 minutes. When done, the salmon should still have a slightly rosy hue but will flake easily. While the salmon is poaching, preheat the oven to 400 degrees. Line a sheet try with tin foil and spray generously with cooking spray. Lay the asparagus on the tray and roast for about 20 minutes, stirring occasionally. When the salmon is done, carefully remove the fish from the oil. This is best done with a spatula. 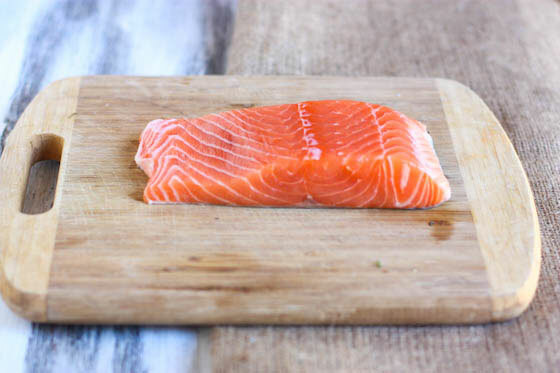 Lay the salmon on a paper towel to drain then place on a plate. 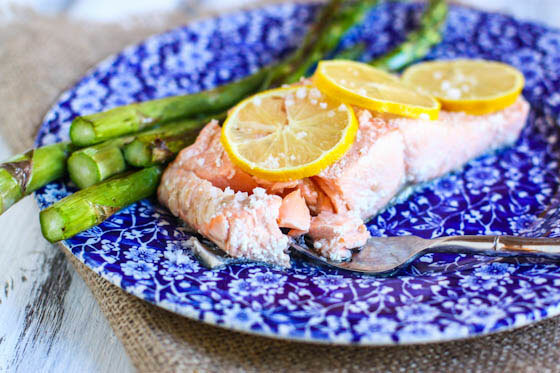 Sprinkle salmon fillets with sea salt and place lemon slices on top. Serve with roasted asparagus. After using olive oil, strain and pour into a Tupperware container. Keep used olive oil in the refrigerator and use to drizzle on vegetables or to poach additional fish.